What's inspiring your young vocal students? Learn the importance of fun and exploration in your teaching studio. How can you engage your young students AND their parents? Listen to the Ultimate Music Interview with Glory St. Germain and Special Guest Nikki Loney. Nikki Loney is a voice teacher, vocal music resource creator and host of the FULL VOICE podcast. She works with singers of all ages, but her passion is the young vocal student. Her evil agenda is to inspire more teachers to welcome young singers into their teaching studios. Her publishing company, FULL VOICE MUSIC shares fun and educational materials for voice teachers and the Full Voice resources are now used in private lessons around the world. Nikki Loney is also an Ultimate Music Theory Certified Teacher! Nikki Loney is Glory St. Germain's Special Guest on the Ultimate Music Interview Series. Glory: Well, hello from the Ultimate Music Interviews. Woo-hoo. Glory: Yay. I'm Glory St. Germain from Ultimate Music Theory, and I am super excited to invite my very dear friend and very special guest, Nikki Loney. Welcome, Nikki. Nikki: Hi, Glory. Thank you so much for having me. This is so exciting. Glory: It is exciting. I want to tell you a little bit about Nikki, so Nikki is not only an amazing teacher, and dear friend, and wife, and mother to Noah, but she's also a voice teacher, a vocal music resource creator, and she always has her "Freebie Fridays". She's also the host of the Full Voice Podcast, in which I've been honored to have been a guest on her podcast. She works with singers of all ages, but her passion is really the young vocal student, and we're going to talk a little bit about that. Glory: And I think her evil agenda, as she calls it, is to inspire more teachers to welcome those young singers, because it's important, right? They want to sing. Why not? Her publishing company is the Full Voice Music, and she shares a lot of educational materials, and of course, materials for voice teachers and full voice resources. And Nikki's also an Ultimate Music Theory Certified Teacher, and why is that, Nikki? Because? Nikki: You forced me to do it. Glory: Exactly. We met. Nikki and I have actually traveled together. We've done workshops together. Why don't you share a little bit about our first meeting, Nikki? Nikki: Oh, my goodness. Okay, sure. Glory and I met. We had I'll call it a blind date, perhaps, so our distributor, our Canadian distributor had this great idea that Glory and I would team up together and do a tour doing workshops for music teachers, and it was a great idea. Glory, I think you had already been doing them in Winnipeg area and in the west coast. Glory flew out to Ontario. I picked you up in Ottawa, and it was like, "Hello, my name is Nikki," and, "My name is Glory," and we just kind of got to work. Nikki: And then we had to travel from Ottawa down to Toronto, which is three, four hours, but we got stuck, and anybody from Ontario can appreciate this. We got stuck on the 401. There was a horrible accident, and Glory and I were stuck on the 401 for about four hours, and we got to know each other. We talked, we knew each other's life stories, we knew our deepest, darkest secrets, and I had packed a little bit of snacks for our road trip and I think we ate all of the snacks within the four hours. We cleaned out all the food in the car. Nikki: Anyhow, we finally got to our destination, but we were best friends and we'd been really good friends ever since, and any time we get a chance to partner with each other we take advantage of that, because one, we're both really passionate about theory and about music literacy, and because hanging out with each other is fun. At least that's what I think. Glory: Yeah. Well, it is fun, and I know when you came to Winnipeg, we've done a lot of professional development workshops together, and it's really one of the reasons why I love you so much as a friend. We've done a lot of fun things together. We've even gone shopping and bought matching outfits. Nikki: Oh, my god. That's right. We did do that. I forgot about that, and then we did a Facebook Live with our matching outfits. I remember, yeah. Oh, my goodness. Glory: Yes. It's a lot of fun. One of the reasons I think that I wanted to do the Ultimate Music Interviews was because we do share that passion for sharing knowledge, and what a perfect place to just have a cup of coffee and to get some information. And I certainly want to give a shout-out to the Ultimate Music Theory Certified Teachers that are joining us this morning, and those teachers and maybe music students that are interested in learning more about the Full Voice Workbooks and how we can implement those teaching techniques. Glory: Because you have done an amazing job not only on your podcast and on all of your training that you provide when you're doing your workshops, Nikki, but also the resources in the Full Voice Workbooks themselves, and of course, I've gone through all of your materials because I love them and it's interesting, we've shared a lot of training together. But let's just back up a little bit, and maybe talk about what was your first, you know, because we all have, "How did we get started," stories, so what was your first introduction to singing and in your path? Nikki: Well, I am a very blessed person. I have a dad, George Loney, who was a singer, is a singer, he still sings. My dad grew up in Toronto, and he sang in an R&B band, all in the '60s. He loved performing, he loved singing, and when I was really young my dad would play the guitar and he would teach me songs, and then he would make me sing when people came over for coffee or for a dinner party. It was, "Oh, Nikki's going to sing everybody a song," and I sang with my dad well into my teenage years. We would do a lot of performances together, and I've always had really supportive parents. My dad fought for every opportunity that I could have ever had. Nikki: My dad introduced me to local musicians. I had wonderful recording studio opportunities at a very young age, and you know what? To this day, although I'm not performing as much as I once was because I'm busy with teaching and with my publishing company, my dad is still my biggest fan. And no matter where I'm performing or what I'm singing, my dad and my mom will be right there, and I'm so lucky, because I know not everybody has that support. And when I was old enough and started to decide post-secondary, I was going to continue with music, my parents were like, "Of course you are. Good for you," and I had that support all the way through, all the way through, so I'm really lucky that way. I don't take that for granted. I talk to my dad every week, and there's always a conversation about music or something or asking me what I'm up to, so yeah, so that's how I got started. Glory: Yeah. And it's a great story to share, because you are so passionate about teaching young students that that connection, that support ... I call it sort of that triangle, that foundation. Yes, we have a teacher, and yes, we have our student, but honestly, if you don't have the foundation of the parents support it kind of can't be as strong as it could be. So I'm sure that in working with young students, a big part of that is also working with the parents, and you're almost teaching the parents how to be a support for their students, so now you're a singer. And one of my favorite ones is your video about the Latte Boy. Nikki: Oh. That's a fun little song, yes. Glory: We'll have to share that in our show notes later, but so now you're a singer and you've been performing, and you have the support at home, so what motivated you to kind of start your musical journey into teaching, and inevitably, into your business? Nikki: Okay, so also a great question. It's probably not the story people are expecting, but I think this is common in our industry. I went to school post-secondary for performance because it was my passion, and very quickly I discovered after graduating from college that making a consistent living from performing is very difficult, and then for those of you out there, it has nothing to do with talent. There's just such limited work, and it was always feast or famine, so a friend of mine recommended me to take a day of teaching, and I thought that it would be so easy, and I thought, "Oh, teaching, singing. I can do that." Nikki: And as everybody who is a professional music teacher can attest, it is not easy, and there were no resources back there then. This was, like, over 20 years ago. There were no resources for young singers. There were fewer compilations of music, first thing, and I didn't have any colleagues. I didn't have a network of teachers that I do now, which I'm so lucky to have, so I soon discovered that teaching was very difficult, and quite frankly, it was a part-time job that I absolutely hated. And I always joke with people, I'm like, "Yeah, I was young and I needed the money," and that's the truth. It was just a little bit of extra cash to get me through the month, and it really wasn't my passion in the beginning and it was really frustrating. Nikki: I had students of all ages. I had no support. I was in a very small music school. They didn't have really a lot of resources, and it was touch, and what was really challenging was the younger students, the really young singers were just the most difficult and I really struggled with them. And it was my dad, because I was complaining about how hard teaching was and how miserable it was. My parents are entrepreneurs, hard-working people, built a business from scratch. Nikki: And my dad's like, "Fix the problem or find something else to do," so those were my two options. There's no whining about this, so he was right, so I started to reach out to other teachers and I started to build my network of colleagues, and I started to ask more questions and dive into more pedagogy. And I started to make connections with my students, and I started to get more better lesson pacing, and as my community of teachers grew, my teaching skills grew, and I started to feel really comfortable. Nikki: But what was interesting is that for a little while I was really struggling with the little kids and I finally said, "You know, I don't think any child under the age of 10 is ready for voice lessons, so I don't want to teach them," so when I see teachers talk like that I know what they are going through. And then because I had removed all of the younger voice students, I had to start teaching piano lessons, which I'm not overly qualified to do but it was something that I had to do to fill in my teaching spots. Nikki: And I started going to piano pedagogy workshops, and I started to learn a little bit more about working with really young piano students, and I started to make the connection about meeting the student where they are at and presenting the information based learning with games, with activities. And I thought this is what was missing with my lessons with the little ones, is that I was trying to teach them like my older students and I wasn't connecting with them. I was expecting the little ones to be where I was at rather than watching them and presenting material in a more engaging way. Nikki: After kind of making that realization, I started to rethink lessons for young singers. I started to talk to a lot of classroom teachers who specialize in working with young singers and young musicians, and I talk to a lot of piano teachers who are working with young singers, and we really started to draw out some really good teaching techniques and strategies that are more appropriate for the young vocalist. And when we started doing that, well, first of all, we had far more fun in our studios. We saw immediate success with the kids. We also had incredible student retention. Nikki: And that's a challenge for voice lessons sometimes, is keeping students in lessons longterm can be really challenging, and we started to see more student retention, better progress, we got parents more involved because they could actually see the feedback and the progress. So it was a long journey from starting teaching just to make ends meet, and then discovering that there's this amazing opportunity to really engage with young musicians, and then of course teaching is my passion now. I love it. I'm an advocate for working with young singers. Nikki: You're right. It is an evil agenda. I want teachers to discover what I discovered, that it is important work, it is rewarding, it is so much fun, and providing a safe space for a young singer to discover their voice is such a gift, and we have this amazing opportunity. A long journey, but I love where I'm at. I leave my teaching studio at the end of the day. I might be physically tired, but my heart is full and I always have fun stories to tell my husband at the end of the day. Nikki: Like, "Oh, this person said this," or, "This person said that." Nikki: I'm super blessed, super blessed. Glory: One of the things, and as we mentioned, that we've done some traveling together and obviously seen each other's workshops and so on, and one of the things that I was always in awe of, and if we have teachers on our caller. If you're watching the replay, go ahead and just type "young singers" in the chat box, because we've got some great resources from Nikki and we'll make sure to send you those, so just in the chat box, you know, "young singers, teaching young singers". Tell us a little bit about where you're at with your teaching. One of the things that I always admired, and I still remember the visual, and you've talked about the amount of research that you did. Sorry. Research. Glory: The amount of research that you did in just communicating with other singers and other teachers and young students, you really did your homework in developing the Full Voice Workbook Series. And I always remember, I think it was this giant hammer coming down with, you know, the sound of music and there was this big hammer and say, "You need these teaching tools." And I think you mentioned, too, that there were no resources out there, and as a publisher, an author myself, I totally get that. As a young teacher, me too, just wanted to buy a car, only reason I was making five times more money than my friend working at the Dairy Queen. Glory: But I think that by providing these, and in this day and age how we can connect through our Facebook groups and through networking, the opportunities now to learn is incredible, and when you have the kind of resources that you provided for teachers, and also teachers I think now are more open to being coachable. It's one of my favorite words because you can go and buy a book, but are you coachable and open to learning how you can use these resources? Because to buy a book and to actually teach it are kind of two different things. Glory: Maybe a little bit about in connecting with teachers, and obviously you do a lot of that through your podcast and your Facebooks and so on, what do you maybe see as the one missing technique that would maybe help teachers in today's world as a teacher? Nikki: That is a great question, and first I want to back up there. I want to thank you for acknowledging how much research went into ... Anybody that's a resource creator and has ... I mean, it is a lifetime of work, and one of the things that I really want teachers to know if they're looking at that are resources is that they have been thoroughly kid and teacher tested, and kid comes first. With our stuff, if the kids don't like it, it doesn't get published, and we actually delayed putting out the third edition books because we did. Everything that we put out has been put in front of a child. We watched them how they engage with it, and it's about them. Nikki: And so it doesn't matter what type of learning style I am or how I need to relate to my voice. I need to actually be really present in watching my students and see how they use the materials and see how it encourages them to sing or explore, or learn a new theory concept. And that, I think, going back to your last question there, I think that is probably one of the hardest things as a music teacher, is it's not about us, and that's hard because we've all been on this incredibly long journey in our learning, in our performance, and if you're a vocalist. I mean, your instrument is one of a kind, and if you've had people say unkind things about it that's trauma, we have all been through the trenches and the wars with our instruments, with our voices, with our learning, with our journey, and all of that has to be set aside when we are faced with a child, with any student really. And that's hard. That's really, really hard. Nikki: And you know what you were saying about, you know, "You can get a book but can you teach it?" A lot of teachers will say to me, "Well, I'm not really into the solfege or the tonic sol. I didn't really learn that way." I didn't either, but when we were testing with the kids, some of the kids gravitated to using the hand signs. They needed that. They needed to put the notes in their bodies, and some of our kids are, as you know, you've talked about this, and this is one of the wonderful things in the Ultimate Music Theory course, is you talk about learning styles. You address neurolinguistics programming, like how we speak and how we communicate. Nikki: It's really difficult to get out of our experience and our preferences, and I am always challenging myself, and I'm always asking other teachers to challenge themselves, and that's one of the things I'm so proud of, is that if you go to any of the testimonials about any of our resources, you'll often see teachers commenting about how much their kids like to use the resources. And that, to me, is the most important thing, so when you put something in front of your students, do their eyes light up? Do they start to ask questions? Do they want to get their pencil and start writing something in? Nikki: I have little ones where I'm like, I have to just take the pencil away for a second, and then I give the pencil back, but there's just so many things that we need to set aside in our own journey so that we can really be effective with our kiddos, and we know so much more. We know so much more about learning styles, learning disabilities. We have to take into consideration even just extrovert and introvert. In singing, an extrovert, yeah, they're going to just let it go, but an introvert might be a little more reserved, and that's a whole other challenge. So I think that the more we can set aside our personal preferences, and that's why I love play-based learning, because within play-based learning the kids ... And I do play-based learning with my adults too. Adults need to play around too. Glory: They do. It's really the mindset of, you know, that's just the key, and I do a lot of reading and research too about just mindset. And if you think of an athlete or a performer walking onstage, and one of the things that I love about your program, Nikki, is it is the Full Voice. And oftentimes, when you think you're a singer but you don't take the time, as you've developed these resources, to actually learn and understand solfege and music theory, because you are not just singing, but you are also communicating with and accompanist, or you might need to change a key. And if you don't even know what a key is, then how can you change a key? Glory: So I think that you've really provided those even for young singers, because that's when you're just that little open to learning, right? You just are like, "I want to learn everything that I can," and because you're doing it in a fun and engaging way. Like you said, I gotta take ... I remember one of the videos you shared in one of the workshops that you did, and there was this little girl and she was doing the workbook with you, and she kind of looked at you and said, "Well, can I show everyone my book?" Glory: Because she was so proud to say, "Look what I did," so how did you get started in creating the Full Voice Workbooks? What was the path that led you to saying, "You know what? I'm doing this. I'm going to publish something that's going to be something that not only you were using in your studio, you've done all the research. How did it come into fruition and say, "Okay, I'm a publisher." Nikki: Well, that's a really good question. In the beginning, there were no resources, like zero resources for young singers, so I was using a lot of piano ear training and sight reading books, and they would be useful to a point. There would be a point where it wouldn't work for a singer, so we started to ... And when I say we, I should shout out to my dear friend and colleague, Mim Adams. Mim is the co-creator of the Full Voice Workbooks, and she still collaborates with me today, so I had met Mim at one of the music education centers that I was teaching at. And we just started to talk about how challenging it was, and Mim has a similar background that I do. She studied jazz, and she also loves theory, like she loves arranging, and she's just a brilliant musician as well as a fantastic singer. Nikki: And we were talking about how do we incorporate more theory into our lessons with our singers, because if you just have a lesson that's just vocal warmups and songs, you're really missing fundamental skills, and I love what you said there about transposing. I spent my entire college career transposing charts so that they were in my key, but even nowadays, being able to go online and purchase your sheet music for your song that you want to sing but understanding what scoring you need and what key it should be in is such a challenge. And I get so many adults that come to me and that's one of the first things that I have to work through with them. Nikki: I say this lovingly. It's frustrating. It's frustrating because they have gone through an entire life not knowing basic theory where they can just buy themselves a piece of music that they can hand to an accompanist, and you are also correct. We forget music is a collaborative art form. We will either be singing with someone else, we'll be singing in a choir, we'll have an accompanist, we'll be singing with a band, and the vocalist should be able to ... I hate using the word should. Is encouraged to be able to speak to them, whether it's like, "Let's take it from the bridge," or, "Can we take it from this?" Those are just simple conversations that we have to be able to have. Glory: Absolutely. I remember I had one adult student who came to me. She's a professional vocalist, and she said, "I'm not here to take piano lessons, Glory. I'm just here to take theory," because she said every time she would meet the band, and I know you totally get this, they'd say, "Oh, Leann," is her name, and she's probably watching so I'll give a shout-out to her. And she still is a professional musician but she now does play guitar and a whole bunch of other instruments. But at any rate, back then she said every time they said, "What key do you sing in?" She said the key of G.
Glory: Always, and so we had to have that lesson about, "Well, here's your range and if this song is in the key of G but this note is out of it, then you can't sing in the key of G," but I think that those, like you said, where do you start just coming in? Those are just crucial, crucial skills that, as a young singer, if you can learn them they're just like second-nature. It's just part of the learning experience, and certainly I think it's important for teachers to have those tools and sometimes maybe they don't. Glory: I do want to say that if you want more information, you can go to Nikki's website, TheFullVoice.com. You can connect with her podcast and all the other resources that, so it's TheFullVoice.com so I want to make sure that we mentioned that. We've talked a lot about sort of the music theory and our connections. What do you think is maybe the biggest challenge of implementing theory into a voice lesson? Nikki: That's a great question. I think a lot of teachers we really want to specialize. We really want to focus on just voice production, and not that that's not important. Healthy singing and developing the voice is so important, but if you're working with younger singers, and by younger singers I mean under 20, right? Like singers that are just learning, but especially introductory vocal music lessons. We have to have a well-rounded approach for all the reasons that we just said. Music is a collaborative art form. I think the master apprentice approach of just teaching voice and focusing only on the voice really leaves huge gaps in understanding in confidence, in being able to work well with other performers down the road. Nikki: I mean, we want to think about the end game, and in a private lesson it's really easy, and it feels good too, to specialize. You just want to fix those fundamental problems, but if we can have a more holistic approach and incorporate music theory, writing, singing, clapping, rhythm. Fundamental music skills are the responsibility, I believe, of every music educator. I know that I've have conversations with voice teachers who really feel that, "You know, I just want to specialize in voice production and singing," and I get that. I do. There's nothing more that I'd like. I'd love a lesson where we can just work on some very specific vocal challenges. I love those lessons. Nikki: But with thinking of the long game, the end game, I want my students to be able to enjoy music and have many opportunities available to them, so I want them to be able to communicate with an accompanist. I want them to be able to look at a piece of music and be able to follow it and know when to come in. I want them to be able to clap and tap a rhythm, or hey, maybe even pick up a percussion instrument and join in the band. We have so many more opportunities when we can facilitate comprehensive lessons. And that I also find is super helpful in getting to know our students, so we get to know a little bit more about their learning styles, about how they process information, how they communicate when we are doing more comprehensive lessons. Nikki: I mean, just watching a child write in a workbook can tell you a lot about how you need to pace your lessons, and that, like if I see a student that's really struggling, that needs to write really slowly, I'm going to have to slow down my lesson pacing. It might take them longer, it might take them more repetitions, and that is never a bad thing. We all learn differently, and that is the one gift, I think, of being a private teacher, is that we can cater to that child. We don't need to rush them through a curriculum. Nikki: Here in North America, like the September to June mentality of, "We've gotta be here, and then we've gotta be here at the end of the year," that's where kids fall through the cracks. That's where kids get lost. I mean, classroom teachers struggle with that, and God bless them. I don't know how. I have five kids in my introductory vocal class, and there are days where it feels like 100 kids. Glory: Well, and you're right because you are teaching even within that group, you have visual, auditory, kinesthetic learners, and we do learn differently. And on top of that there's submodalities, and so there is a lot to take in as an educator, and I think sometimes just taking a moment to observe and listen what are they interested in. Because when you start and you're teaching young children and you've been teaching for a long time, so the great thing is sometimes those young students stay with you for a long time and you get to see them either going off to college or maybe this one loves to sing jazz, and this one wants to sing pop, and this one aspires to sing opera. They just want to go sing at Carnegie Hall, like they all have different aspirations. And put them on that path, but give them the tools to be successful in whatever genre they are going to move into. Glory: I think that's really a huge responsibility as an educator is to not just think about the lesson, and as you said, don't just think about September to June, but think about the end game. What excites them? What are they listening to on their iPod or their iPhone? What is that? Because it's different for all of us, even I look at my own students and some of them, yes, they do love classical music. Some of them, yes, they do want to improvise and play jazz, so I think to teach to the whole student and to teach with the Full Voice in mind, is that it's beyond just, "I'm singing this song. This is my repertoire, repertoire." But you're really providing them with the tools to be successful in the long run and in the end game. Glory: And I do want to mention that Nikki is also providing a free resource for your, so if you just wanted to type in the chat box "Full Voice" we'll make sure to get you that at the end. We'll throw that into the link, so just "Full Voice". Type it in and we'll send you that. We do have some comments here, and I should just reach out, so Christopher is asking how to keep adults from feeling belittled by play-based learning, as if we think there's still children or not an adult intelligence level. So this is a question from Christopher, how to keep adults from feeling belittled by the play-based learning. I'm going to let you take that one, Nikki. Nikki: Sure. That is a great question. When I am playing around with my students, with my adult students, well, first of all, I'll basically say, "Look, this is a cool little game that I play with my kids, but it's actually a really fun thing. Do you want to try it?" I don't say, "You are going to do this." With my adults, the adults that come to me often really need a safe space just like children do. They need to feel validated, they need to feel safe, they need to feel secure. And you're right, if you just were to say, "We're going to play this game," that might make them feel a little uncomfortable, but I always present things like, "This is a game that I like to try, and it's a lot of fun." Nikki: I just put it out and I allow them to choose whether they want to participate or not. What I usually find is they might hesitate a little in the beginning, but then I'll challenge them. I say, "Okay, you know what? Kids might struggle with that, but you and I, we can try this," and again, it's just not ... I always encourage my students of any age to embrace the word "explore" and especially with my adults who may have had some lifetime trauma or anxiety about their voice. My conversation is, "Do not label something good or bad. It's that's interesting. My voice made that sounds. That's interesting. I wonder why." Nikki: Then we can discuss, "Okay. Well, let's see what we were doing, and this is why it did that," so rather than shutting down when things don't go our way, we're opening up exploration, curiosity, and again, just that mindset. But yeah, the games, I don't force my adults to play. Usually it's just an invitation, and if they're into it they're quite happy to participate. Glory: Yeah, and I like that, what you said about it's really infectious because, well, first of all you're a super fun person and I know that personally, but when you invite someone it's really the teachers presentation of it to say, "Well, you probably don't want to play this kids game." Well, then they're going to say no, but if you go ahead and, "I have an idea. This is super fun. You want to try it?" I'm like, "Hell yeah. Let me in there." You know? Glory: I think it's how it's presented. Now, I have another question here from Patricia, and she said very young children musicianship. She said, "I used to play based learning with singing and keyboard, music games, and how to get them started in the adventure of learning. Do you encourage them to sing and play other instruments, or can you be a singer and understand musicianship skills in music theory?" Nikki: Oh, Patricia, thank you for asking that question. Yes. I think it's actually very important that we allow voice students to relate to music theory with their instruments. Now, that being said, I will introduce the keyboard, like in the Full Voice Workbooks we do introduce the keyboard so they can identify notes. But all of the theory is presented in a way that makes sense for the singer, and I know that this is a challenge, so this is why we like the visual reference of the do-re-mi's, so when I'm teaching, say I'm teaching a young singer about a five-note scale, I don't do it on the piano first. I go to my tonic sol-fa wall and we sing do re mi fa sol, and my tonic sol-fa wall is a big wall. It has big bright tonic sol-fa cards that are laminated on the wall. Nikki: And we will sing without the piano, and I'll be helping them first just with my voice, but then eventually I will make them sing all by themselves because they have to hear this. They have to hear their voice. They have to make peace with their voice. When we're doing rhythms we do body percussion. We clap, we tap, we snap, we stomp, so yes, I think it's really important, especially for people who have an instrument as a reference point. That instrument is your reference point. It is not the child's reference point, and yes, we can introduce it and it is helpful, but the biggest thing we want to do is get them to understand and explore their voice without ... Not without, but separately from an instrument. Nikki: And the perfect example that I love to give people is my husband has taught guitar. He just retired, but he taught guitar, mandolin, and bass for 30 years. Never once did he ask a child to take piano before they were introduced to the guitar, so we can start introductory vocal music lessons and focus on the voice and use the voice as the reference point. And that's why we use solfege or tonic sol-fa. That's why we use body percussion, and that's why we also do writing exercises as well. I mean, I love it when my students take piano lessons. I think it's wonderful, but not every child is interested. Nikki: My heart always breaks a little bit when people are like, "Oh, they have to take piano first and then they can sing." Forcing a child to play an instrument that they're not interested in is a surefire way to take the joy out of learning, and I know that personally because, Glory, you know this story. We put our son, Noah, in piano lessons with high hopes, and he had the finest teacher, the finest teacher. He was a specialized piano pedagogue in children's music. They were fun, they were interactive. He played drums, he did off-the-bench games. It was a cool lesson. My son is a baseball kid, and he hated them. It was misery. Nikki: As much as I would love to have my son do those things, and he's very musical, he loves music, but he's not interested in that. We tried it for a year and that's not where his heart was, so yes, if you have a child that wants to sing, let them sing. Let them sing. Introduce the piano keyboard, but it's not the point of reference. They can relate theory and everything to their voice, rhythms to their body, and yes, that's a great question. Thank you, Patricia, for asking that. Glory: I think it's really true, and you know, we do have to. One of the things, too, and we talked about this in the Ultimate Music Theory Certification Course, is that you have to teach to the child, know their learning style, but also we're really only engaged in the learning if we're interested in learning the subject. You and I could go take a mechanics course. Glory: Yeah, but I think that you have to be interested in a subject to learn it, and when you have young children and they are so excited to take singing, it doesn't mean you have to go learn how to play the mandolin before you can start that. And I remember you always saying that and I thought that just makes so much sense to me, that if your passion is that you want to sing and maybe you just want to sing for your little dolls at home in your room because you're only five, or maybe you aspire to be on "The Voice". Whatever it is, just give them the tools to get started. Glory: And in talking about education, I know of course I'm always taking some course as I know you are because we share, "What are you working on now? What are you taking?" So what is coming up for you next? You've created your masterpiece, and I know you continue to create Full Voice resources, but what's next for you in professional development? You got anything coming up? Nikki: Yeah. Well, I have for the longest time, probably a decade, I have wanted to do the Kodály certification, like the Kodály levels. I did do a lot of research on Kodály and Orff when we were developing our resources, and I have a lot of colleagues that have done this certification. There's just so much wonderful information, so I am doing it this summer. And it's in London, Ontario, and I'm really excited. It's always been kind of a time thing, and my son was always too young for me to go away so this is the summer that I actually get to dive into that. I'm really excited. Nikki: I mean, we're working on some really fantastic resources this year that I'm really excited about. We're working on Christmas, that they'll be out in October, but we've actually partnered with some children's composers, so the Full Voice Workbooks don't have any repertoire in them. And there's a reason for that, so I get a lot of emails about this. The reason that the workbooks don't include repertoire is because every child is different, every voice is different, so the teacher needs to assess the child and choose repertoire that suits where they're at, where their interests are, gender, age, range, all of that. Glory: Oh, that's fantastic, Nikki. Well, I just want to say thank you so much for hanging out with me today and sharing your story and your amazing resources that are helping teachers all over the world teach young singers how to teach and all the effective tools and resources that you've created. And of course, the Full Voice Podcast, which is available, and thanks to Shawn for doing a great job because I know that he works on that with you. Glory: Little shout-out to Shawn. So TheFullVoice.com is where you can go for your resources. Don't forget to just type in "Full Voice" because we've got some great resources that we're going to share with you here in the show notes. And any closing remarks, Ms. Nikki? Nikki: Well, no, Glory. I just want to thank you for having me, and again, I always love talking to you. I feel that we don't get to chat enough anymore now that we're not locked in a car on a highway somewhere. Glory: Yeah. Well, we may have to change all that, but I know I always enjoy sharing professional development resources with you, and one of the things that you really struck a chord with me, like you said, you're learning this course that you're going to take over the summer. I think the mindset that I sort of had an, "Aha," moment with too is that how can you have a course that, say five people take it, and out of those five, one will become massively successful. Well, maybe one of them will just not do anything, and yet you've had the same teacher, the same opportunities, the same course. Glory: What is it that makes the difference between being truly successful and to not? And it honestly comes down to mindset and that you mentioned, just the meditation, just the thought process of going through. I was talking to another UMT Certified Teacher the other day, and she said one of the things she always remembered is I always said speed of implementation, is that when you learn something you must implement it. Nikki: It just goes. It just disappears. Glory: It just disappears, and we've done a lot of workshops together and there's some teachers you'll see at the end of the workshop. They scoop up all the Full Voice Workbooks, they're committed, they're taking action, they're going to implement this into this studio and they're hugely successful. And then others just say, "Well, thanks. I really enjoyed it." Glory: But you're like, "Okay, but you need to implement what you've learned," and I think that's one of the most important gifts that we can give teachers, is take action. Right? Glory: Your key takeaways and then what's your action step to truly get what you want, not only for yourself, but your students, right? Nikki: Oh, for sure. 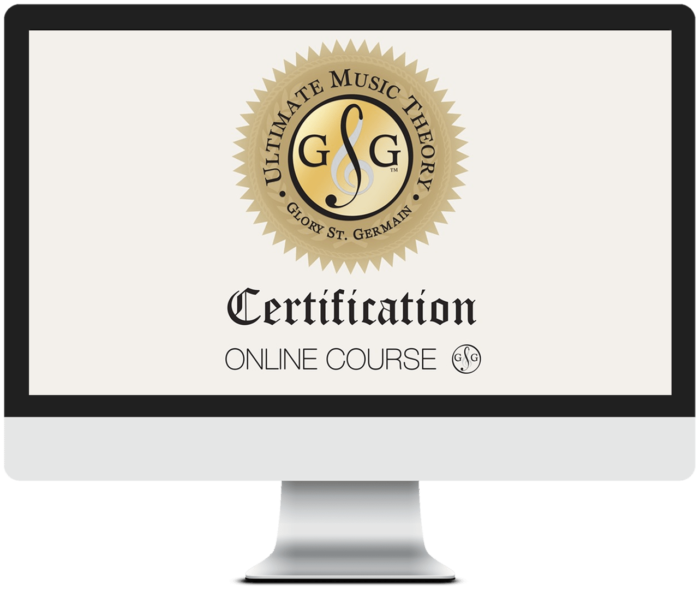 I wanted to just mention, so when I did the Ultimate Music Theory Certification Course, I did the live course, and what was great about that is I love online learning. I am addicted to online courses. I love having an online course and continuing education from your pajamas is always fantastic. But when we did the live course, the interaction with the other teachers and the assignments that we were able to do together was so good, because we got to try things out right there with adults. Nikki: And it was interesting, again, because the question about adults playing games. Well, you had us all playing the games in the course, and it was fantastic. We had so much fun, so yes, I love what you just said there about implementing and trying things out. And just sometimes you just gotta be brave and dive into it, right? Nikki: Right? And again, you don't have to have a narrative about it. It's, "How interesting," like, "I'm gonna try this. What happens?" Right? Nikki: Yeah. But yeah, the Ultimate Music Theory Certification Course was just a fantastic at learning, and I was doing group theory classes at the time and that was a big part of my teaching studio. That actually got me through summertime, because I would do my group classes and I would get really intense with my group classes in the summer. The games were huge, just to keep the kids engaged and learning and just laughing and having fun, it was such a great tool, and it's swell. Glory: Yeah. Yeah. And that's the whole point of teaching, isn't it? It's just bringing joy and education and making a little money on the side, ha-ha. Glory: Well, thank you so much, Nikki. I'm sure our viewers and listeners have enjoyed hearing all about the Full Voice Workbook Series. Don't forget to check out TheFullVoice.com for all your resources. Nikki, you're amazing. Thank you, and I will see you soon, my friend. Nikki: Thank you, Glory. Have a wonderful day. Thank you, everyone.